In this Issue, explore the rich tapestry of Saint Lucia’s Culture as the island turns 35 on February 22nd. 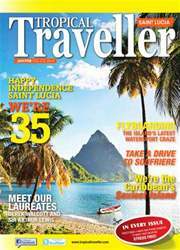 Meet our Nobel Laureates and see why we’re the “Sexiest Island in the Caribbean”. Learn how to Flyboard and so much more… Also in this and every issue, find maps, directories, important contact numbers and everything you need to make your vacation stress free.